We keep hearing dentists pleading us to brush our teeth and floss properly to avoid dental procedures. However, we do not realise the importance of preventive care until faced with problems such as carries and plaque buildup. A professional water flosser aims to make the process of flossing easier and much more effective. Using a reservoir of water, it throws water out with pressure through its flosser tips. The tip provides a focused aim for flossing that helps in removing plaque and maintain gum health around teeth with orthodontic procedures. Waterpik is the most trusted manufacturer of automatic water flossers, to the point where a water flosser itself is often referred to as ‘a Waterpik’. 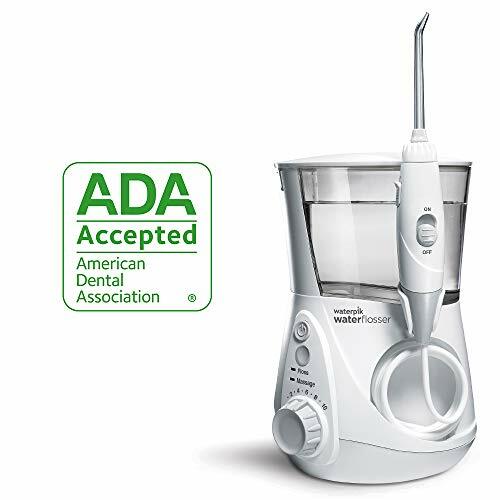 The most reassuring feature of this product is that it is ADA (American Dental Association) accepted, which means it is entirely safe to use and will most likely live up to its claims of improving gum health in just two weeks. The new design of this water flosser is sleeker and more compact in comparison to its previous models. It has a water reservoir on top that allows for 90 seconds of water capacity before it needs to be filled again. There are 10 water pressure settings, lower settings can be used for children and those that have weaker gums or are using the water flosser for the first time. The pressure settings can be gradually increased with use so that the gums become accustomed to the pressure. There are two main settings on this product: floss and massage. Flossing helps clean spaces between the teeth and massaging is meant for stimulating the gums and improving circulation so this product beneficial for both external and internal oral hygiene and health. A 1-minute timer and 30-second pulsation settings are also present so that the user knows how long has past while flossing. Overall, this product is the ultimate go-to when purchasing a water flosser, but some previous models from the same manufacturer may be more pocket-friendly and suitable for general, one-person use. Quite a noisy product: The manufacturer claims this model to be quieter than previous models like the Waterpik Ultra, but customer reviews suggest that there isn’t much of a difference in the amount of noise these models make. An automatic water flosser for children comes with low-pressure settings. If you live alone and do not have braces or any other dental procedures, you can buy a simple water flosser with only a few general tips, this will be enough to maintain your oral hygiene. However, if more persons intend to use the product, look for one with more tips. If you have braces or other procedures, choose a product with specific tips. Some of the items are too large to store in a small bathroom, and because water splashes all around, they cannot be used anywhere else but in a bathroom. Flossers, in particular, make quite a lot of noise. This factor may be important if you share rooms with another person. Some of these products have plugs meant only for use in a specific region. If you use it another region, be sure to use a voltage converter. Warranty will no longer apply in other countries unless the product has a global warranty. Oral hygiene products made by well-recognized manufacturers and with excellent customer reviews and ratings can be expensive. But all products have a guaranteed benefit on hygiene and overall gum health. They are no doubt superior to using regular floss and toothpicks and are time-saving too. It is a known fact that dental treatment is costly and even common problems like dental carries can be hard on the pocket. A one-time investment in an automatic flosser with many tips can save dental treatment expenses of a whole family. More importantly, it can prevent the development of severe oral diseases.